A knock-off MacBook Air running Windows, a tablet computer shaped like a big iPhone and another tablet meant to rival Apple’s iPad were all among the devices shown off by a small Chinese gadget maker on Thursday. 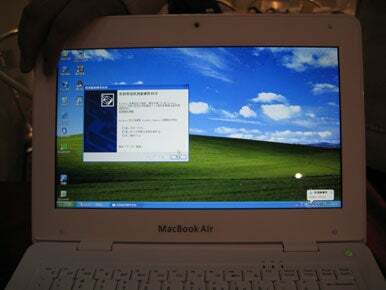 This counterfeit MacBook Air runs Windows XP. Its Chinese maker, Teso, says it sells several thousand units per months and has already offered the laptop for more than a year. The tablet shaped like an iPhone uses the hit Apple phone as a model for details down to the curves on its black rear shell and the single circular button below its screen. But it uses an Intel Atom microprocessor and its screen measures 10 inches, similar to the 9.7-inch screen on Apple’s upcoming iPad. “If you’re going to copy, then copy the most expensive and the most popular,” Wu said at a trade show in Shenzhen when asked about the similarities between his company’s devices and those from Apple. China’s notorious industry in knock-off electronics including mobile phones is largely based in Shenzhen, a manufacturing base where factories churn out gadgets for well-known companies like Apple. Counterfeit iPhones are widely sold in anarchic electronics markets in China alongside genuine versions of the iPhone and other handsets, such as phones from HTC, that are bought abroad and informally carried into China. Many other phones sold in those markets copy from Apple devices, borrowing the company’s logo or its iPod scroll-wheel rather than replicating the iPhone in full. Teso sells more than 5,000 of its imitation MacBook Air laptops each month, at a price per unit of 1,900 yuan (US$280), Wu said. That is far less than the real MacBook Air’s starting price of $1,499, as listed on Apple’s Web site, but the two machines are similar only in appearance. The Teso laptop has an Intel Atom microprocessor and runs Windows XP, the most widely pirated operating system in China. The white Teso machine does carry the Apple logo on the back of its screen, the words “MacBook Air” beneath its monitor and a wide, single mouse button like those below the keyboards on Apple laptops. “I couldn’t sell it in America,” Wu said, citing likely problems at customs. Its design strongly resembles an iPhone, but this is actually a mock-up of a tablet computer with a 10-inch screen from Chinese gadget maker Teso. 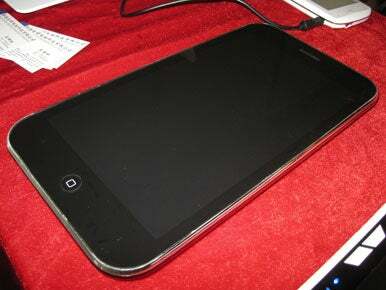 Teso tweaked the tablet’s design in a bid to avoid rights infringement since its shape is based on the iPhone, said Wu. “The appearance of mine is similar to Apple’s, but theirs is a mobile phone,” he said. Teso also displayed another tablet with a 10-inch screen running Google’s Android operating system. An improved version of the tablet, which uses a chip with Arm architecture, could go on sale in around four months, and Wu wants it to run like an iPad, he said. It will sell for around 1,200 yuan ($175) and come loaded with popular applications, Wu said. But the iPad, while more expensive at a starting price of $499, is sure to give users access to many more applications through Apple’s App Store.